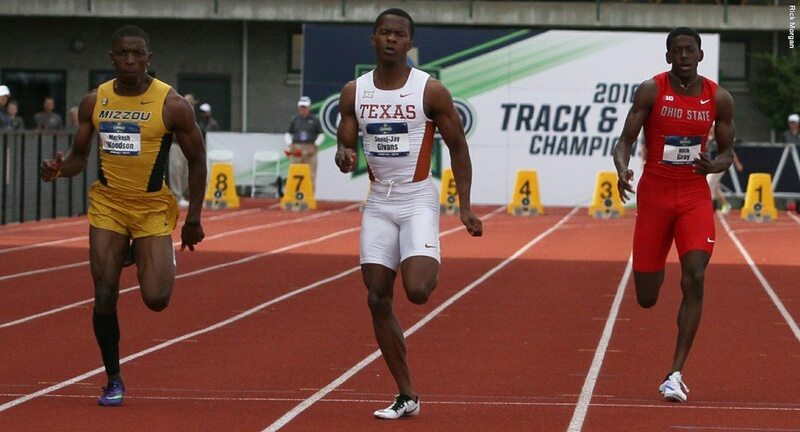 Junior Senoj-Jay Givans ran the fastest 100-meter dash in the history of the UT track and field program in the semifinal of the NCAA Track and Field Champioship (photo courtesy of texassports.com). EUGENE, Ore. – Action began on Wednesday at the NCAA Outdoor Track & Field Championships and one Texas Longhorn threw down the gauntlet during the semifinals. Junior Senoj-Jay Givans became the first Longhorn ever to run a wind-legal sub-10 in the 100 meters when he crossed the finish line in 9.96 seconds to post the fastest time in the semifinals. The legal tailwind makes it a new school record and also ranks No. 9 in collegiate history. "We knew Senoj-Jay was primed and ready because watching him in the 4x1 earlier on the backstretch he was opening it up," head coach Mario Sategna said. "He's been through this a number of times now and he has really made tremendous strides with his meet management at the national stage. To run under 10 seconds with a legal wind set the tone." Givans' time was the fastest in the semifinals with Tennessee's Christian Coleman running 10.03 seconds. The four fastest times of the semis came from Givans' heat, which was the last of three. That bumped TCU's Ronnie Baker out of the final. Baker entered the meet as the favorite to win and a season's best time of 9.95 seconds. Givans has proven to be dangerous at the NCAA meet. Last year he finished fourth with a wind-aided time of 9.97 seconds. During the semifinals last year, he broke the school record, clocking 10.03 seconds. "Senoj-Jay definitely rises to the occasion," Sategna said. "We've always known he's got tremendous ability, and I think he's still capable of something even faster." The Longhorns were in action in seven other events on Wednesday but were unable to advance to the finals in five running events or score in two field events. Texas got its action started on the day in the last heat of the men's 4x100-meter relay semifinals. The Longhorns ran the team of Charles Anumnu, Givans, Zack Bilderback and John Burt. Timers had to extend the times to the thousandth of a second to determine if Texas would advance to Friday's final. Burt got the baton in second place in the heat and Arizona State very close behind. At the line it was the Sun Devils getting the second-place finish to grab an automatic spot to the final, beating Texas by .003 with both teams officially clocking 39.26 seconds. ASU was credited with 39.255 compared to UT's 39.258. The Longhorns were not fast enough to get one of the two spots available based on time and finished ninth, one spot out of the final. Alex Rogers was one of just three freshmen to qualify for the NCAA Championships in the 1,500 meters, finishing 24th in 3:56.52. Another freshman was making his first appearance at an NCAA Championship for the Longhorns in the 110-meter hurdles. Burt finished 23rd, in 14.32 seconds. One of just two freshmen competing in the long jump, Steffin McCarter placed 13th place in his first NCAA appearance with a leap of 7.45 meters (24 feet, 5.5 inches). He missed qualifying for the final by just six centimeters. A fourth freshman made it to Eugene for the Longhorns in the pole vault. Barrett Poth cleared 5.15 meters (16-10.75) on his second attempt to finish in a tie for 17th place. Sategna said having four of the eight individual entries at the meet be freshmen for the men was a great accomplishment and a testament the program is in good hands moving forward after gaining valuable learning experience for them this week. "I'm very proud of all the freshmen we have here," Sategna said. "John, Alex, Steffin and Barrett to get this far it's not about hanging your head. Everybody wants to come here; and they want to PR, score points and be an All-American but it's a learning process." On the other side of the coin, Bilderback ended his career wearing a Texas uniform Wednesday. During the indoor season this year, he became the first man to win the 400 meters at the NCAA indoor meet, but he was unable to repeat that feat outdoors. He crossed the finish line in 46.82 seconds to take 21st place. One more senior ended his collegiate career as well for Texas. Former All-America and Big 12 champion Reese Watson tied with teammate Poth for 17thplace in the pole vault. "Zack and Reese, those are two pillars of our men's program that completed their careers," Sategna said. "It doesn't always go how you want, but it isn't from lack of effort. I'm very proud of them." Robert Uhr made his NCAA Championship debut as well for Texas, finishing 24th in the 800 meters. Action continues Thursday at the NCAA Championships as the women begin their first day of competition. The women will contest running semifinals while holding finals in four field events and the 10,000 meters. The men will also conclude the decathlon Thursday. Texas is slated to compete in eight of the 10 semifinal running events and has two pole vaulters set to compete Thursday for the ladies. Action starts at 12:30 p.m. CST in the decathlon with the first Texas event scheduled for 6:32 p.m. in the 4x100-meter relay semifinals. Fans can watch the action live online on espn3.com and via the WatchESPN app on their tablet or smartphone with live TV action on ESPN2.